OyeGifts is all geared up to celebrate the season of love with a variety of gifts – including flowers, chocolates, gift hampers, combos and a lot more. With plenty of gift choices, it's easier than ever to say 'I Love You' this V-Day. 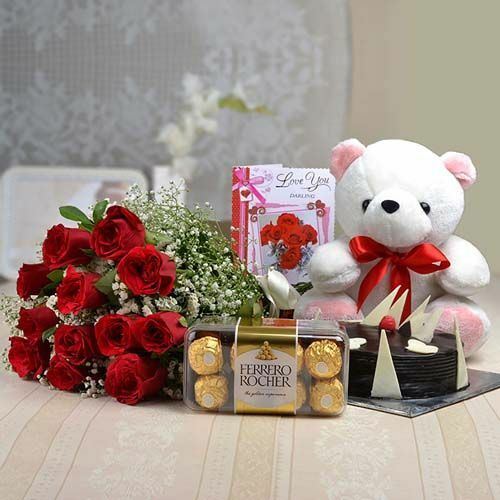 DWARKA, India - Feb. 12, 2019 - PRLog -- Valentine's Day celebrations are in full swing, and OyeGifts – a leading name in the online gifting industry – has decked up its online collection with a variety of mesmerising gifts. Besides the existing collection, there's a whole new range of exciting gift options for the customers. There are flavourful cakes all decked up for the most romantic season of the year. Not to forget are the stunning bunches of flowers, tempting chocolates, and love filled personalised gifts. Paying a visit to the website of OyeGifts will expose customers to the most appealing Valentine's Day gifts for romantic celebrations. At OyeGifts, there's no dearth of choices when it comes to finding gifts to express love to someone special. A blissful bouquet of fifty red roses is a heavenly sight! It's a hot pick among couples to cherish the undying love and romance. This gorgeous combination has the power to bring a bright smile on his/her face when he/she reminisces about it. This goes without saying that the Love Begins bouquet is the perfect Valentine's Day Gifts for Her. A sight at the bunch of 100 roses gives abundant happiness beyond imagination – a feeling that everyone wants to rejoice on Valentine's Day. Making the moment more fascinating is the indulgence in delectable chocolate cake. The enthralling combo is romantic beyond the wildest imagination. The voyage of love doesn't go as smooth as expected. Sometimes, it has to withstand the test of time. For those who successfully overcome all the obstacles and eyeing a fresh start this Valentine's Day, OyeGifts bring special combos like Special Surprise Arrangement to celebrate the day of love. Everything in the Personalised Gifts gallery makes the perfect Valentine's Day Gifts for Him. A personalised message with the gift is enough to fill the heart with eternal love. OyeGifts has come up with a variety of gifts which symbolise love and convey emotions with sheer perfection. Whether it's a new found love or a love-story that has celebrated several years of togetherness, OyeGifts has the perfect gift for everyone to celebrate romance on Valentine's Day. The online gift portal offers several Valentines Deals (https://www.oyegifts.com/deals) for exciting celebrations. OyeGifts has emerged as one of the leading names in the online gifting industry for providing the most unique gift ideas for all lovely occasions. With a wide network of expert florists, artistic bakers and prompt delivery services, OyeGifts now manages a pan India delivery of gifts including same day as well as midnight delivery of gifts. What's more, customers also get excellent support services and a delightful experience with their every purchase.